The content of this article provides interesting history, facts and information about Gladiator Sandals. The basic and protective clothing worn by gladiators is detailed in Gladiators Clothing. Gladiator sandals and boots are not to be confused with the ocrea which was a metal leg guard, or greave, that ran from the knee, or sometimes the thigh, to below the shin protecting the front of the leg as shown in the above picture of a gladiator. Many of the gladiators fought barefoot but others wore Gladiator Sandals. Absolutely no Roman citizen would appear in public with bare feet. This would indicate dire poverty. Roman citizens wore sandals (soleae) - footwear without toe coverings indoors and shoes or boots (calcei or calceus), footwear with toe coverings with straps which covered the ankles, the calf, or up to the knee, outdoors. Sandals are believed to be the first rigid shoes crafted. A stiff sole was attached to the foot by leather cords, straps, or braided thongs. Sandals were generally the most worn type of footwear in warm climates such as the countries surrounding the Mediterranean - the Roman Empire. There were many different styles of Roman Sandals and these styles depended on the cost. Only the cheapest materials were used for slaves and laborers in the plainest of colors. Only Romans of a high status such as the Patricians would wear red dyed shoes. Roman soldiers who were expected to march for many miles had to have strong shoes which were called caliga. The sole of the caliga was thickly studded with hobnails. Gladiator Sandals were worn in the arena. The arenas of Ancient Rome were covered with sand, to soak up the blood. It was not strictly necessary for gladiator sandals to be studded with hobnails. 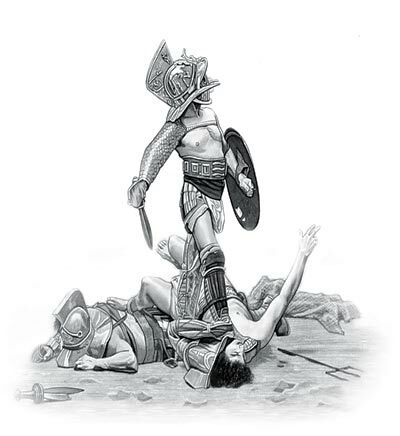 It was, however, traditional for many gladiators to wear the armor, clothes and weapons which came from their ethnic backgrounds and in battle re-enactments which were shown in the arena some gladiators would have played the parts of Roman soldiers - so sandals studded with hobnails would have been worn. The materials used to make Gladiator Sandals was predominantly leather. The Ancient Romans were expert in the process of tanning and produced both supple leather which was ideal for making gladiator sandals and tough leather which was used to make protective armor. The Romans used the hide of animals such as a deer or cattle. The thickest and most durable types of leather were used for making the soles of gladiator sandals and remaining weaker leather was used for making the straps. Making Gladiator Sandals required different sections or layers. The bottom, outside, layer or sole of the sandal, the inner sole, the foot covering and leg straps. The content of this Gladiator Sandals category on Roman clothes worn by the people of Ancient Rome provides free educational details, facts and information for reference and research for schools, colleges and homework. Refer to the Colosseum Sitemap for a comprehensive search on interesting different categories containing the history, facts and information about life and clothes worn in Ancient Rome.